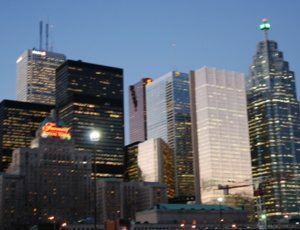 The Toronto Skyline is dominated by bank towers. The banks and credit unions want to work with your small business. One of our Toronto office space for rent tenants was telling one of our office business centre staffers that he recently found funding for a second business he was starting and needed to have a second phone number for that business. Hearing about the new venture and the capital that was acquired for it, was something that got our blog writer curious. It seems that if you are you starting a new small business in Canada or operating one already, there are funding sources through the federal government and commercial banks. There are also ways of capitalizing on your existing small business to gain new investment or secure investment in a new business. When trying to gain new money to invest in your existing business, you should have professionally prepared financial statements. These statements should not only show your profit and loss, but also demonstrate a good cash flow that is on the increase. Lenders and investors want to see that your business is growing. You also need to demonstrate where your growth is coming from and where you will be spending the additional funding for your business. But be specific. Is the money going to be used to increase production, allow for more inventory, secure more office space, increase warehouse space or to add more to your marketing and sales initiatives? While government programs and banks are a great source of small business expansion funding, credit unions can often be the best friend of a small business. A credit union will not only help with finding the right loan or line of credit for your small business, they can also help to introduce you to their other clients who may need your product or service. You do not need to go on a television show like Dragons Den or Shark Tank to find venture capitalists that can help your business grow. There are plenty of venture capitalists who are looking for that next great investment. You only need to do your research to find them. If you do decide to go the TV route, you may not get the investment you need, but you could get some great exposure for your business. Even if you do not need extra funding for your business, quite often some financial management of your business assets is a solid idea. While an experienced chartered accountant is always a good start, there are other professionals who can help you manage your business funds. Having a good relationship with your small business banking manager is also a step in the right direction. A small business banking manager can not only help you plan your loan repayments, but can also help you create a cash-flow strategy working with your receivables. When considering your receivables and how they relate to your cash flow, you can also look at companies who fund receivables. Accounting software companies like Intuit (makers of Quicken and Quickbooks) have other separate companies that offer loans and receivables funding. As we continue to find business funding solutions for small businesses, we will create more blogs and provide more information to our readers. We are also going to try to get one of our credit union friends to write a guest blog about how credit unions are not only different than banks, but also how they specifically help small business owner-members.